Creating online courses can be incredibly lucrative and a great way to create additional income streams for your business. However, you need a system that supports you in your goals so you can focus on creating quality content that makes your members happy. 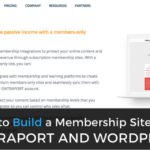 You have a variety of tools and platforms at your disposal that’ll help you build and manage the membership site of your dreams. The route you choose will depend upon the style of membership site you’d like to run, and how much control you’d like over the end result. Below, we take a look at three of the biggest players in the space, Thinkific, Kajabi, and WordPress, so you can finally decide which platform is best for your online course. Thinkific is a very feature-heavy third-party platform for building your online course. Since it’s a third-party system, there’s no additional work on your part to host your membership site. It’s equipped with plenty of themes, so you can give your membership site its own unique feel that aligns with your existing brand. However, it lacks extensive customization options for building out unique course pages. It’s great for straightforward courses, but it’s hard to build pages for membership sites that have various media and layout types. If you do get stuck building out your site, there’s a solid support team that can walk you through any step in the process. There’s also a student discussion feature that acts similarly to a forum. This can help to mimic a real-life classroom and help your students better understand and engage with the course materials. There’s even a built-in course section on Thinkific’s website that will list your course among thousands of other courses, so it’s possible to attract new members without having to do any additional work. Their pricing breakdown is a percentage of your total sales. Not having any upfront fees is nice, but it can get expensive if you have a large membership base. Thinkific is NOT currently one of our supported platforms. Kajabi is another very popular third-party platform for building online courses, which means no additional hosting or site building on your behalf. It’s a great choice if you’re looking to get your online courses up and running in the shortest amount of time possible. They’re equipped with multiple design themes, so you can give all your courses a unique feel. Their setup is a little less intuitive than Thinkific and has limited content options, but it does allow you to create and sell other pieces of content beyond just courses. That is great if you have a diverse offering. Kajabi shines in its marketing resources and email marketing integration that’s built right into the platform, without the need for any additional software. If you’re looking to create your course quickly and want an automated marketing system built into the product, then it’s worth trying out. That being said, it can end up doubling up on what you already pay for in a Marketing Automation CRM like Infusionsoft, Ontraport or ActiveCampaign and it is the most expensive option on the list and will run you $129/month for the starter package. Kajabi is NOT currently one of our supported platforms. WordPress is an extremely flexible solution to use as the foundation of your online courses. There’s no other way to get the level of control that WordPress provides. There will be some upfront costs like choosing hosting, building out your website, and getting technical help, but then the future of your site is completely in your hands. You can build your site out however you see fit. There are dozens of plugins that can help you create additional features, and it can even integrate with existing software you’re using. However, there’s no way for people to naturally find your course, so you’ll need to build and execute a marketing strategy to get people interested in your course. Overall, we highly recommend choosing WordPress when the time comes to build your online course. You can’t achieve the same level of flexibility and customization with the other solutions and time and time again I have seen clients who went with Kajabi or Thinkific only to later have to rebuild on WordPress to get the flexibility and full features they wanted. That being said, Thinkific and Kajabi can work very well for simple courses that don’t rely on a membership model, and for those of you wanting to build the site yourself due to not having technical resources or the support of a team like Automation Agency to make WordPress work for you. If you do want a technical team behind you to assist with building out your online course or membership site on WordPress, then get in touch with us today.